“Whether providing vital medical assistance and education or offering your construction and agricultural expertise, the dedicated workers of Mercy Ships have brought new hope to countless people around the world.” ~ Bill Clinton, Former President of the USA Founder of the Clinton Foundation. Mercy Ships arose from a young man’s experience with tropical Hurricane Cleo in 1964. The devastation wreaked by the tropical hurricane and the human suffering it left in its trail inspired Don Stephens to set up a hospital ship for the world’s most vulnerable people. 14 years later, this inspiring social entrepreneur founded Mercy Ships. He and fellow fundraisers paid $1 million USD for a former cruise liner and work began to convert her to a hospital ship. In 1982, the refitted vessel set sail as the Anastasis – the first Mercy Ship. Mercy Ships has now grown to four ships and has served in 150 ports throughout developing nations, bringing hope, relief and healing to the most vulnerable people. They have provided medical services in excess of $1 billion USD to over 2.35 million people in 70+ countries. Each year, more than 1,200 volunteers from over 40 nations serve with Mercy Ships. Professionals including surgeons, dentists, nurses, health care trainers, teachers, cooks, seamen, engineers, and agriculturalists donate their time and skills to the effort. Mercy Ships is making an impact by delivering life changing surgical and medical care. They also partner with local communities to help them to help themselves. Their results are impressive, and the patient stories are heartwarming and inspiring. So inspiring are the stories that National Geographic is presenting an 8 part mini-series, “The Surgery Ship”. In the series, National Geographic follows a crew of world class medical volunteers from Australia and across the globe on board Mercy Ships’ “Africa Mercy” as they face the biggest challenges of their lives, working to provide lifesaving surgery to those with nowhere else to turn. 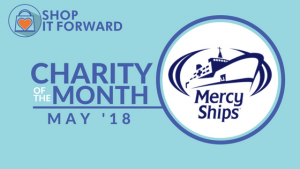 We are very grateful to Mercy Ships Australia for entrusting us to fundraise on their behalf and excited to announce them as our Australian Charity of the Month. In conjunction with the launch of the Mercy Ships’ Mercy May campaign, we will be designating all funds raised by anonymous shoppers to this amazing organisation. You can help Mercy Ships Australia reach their Mercy May fundraising target of delivering 1,500 surgical miracles by shopping online anonymously at Shop it Forward OR join Shop it Forward (it’s free) and nominate Mercy Ships Australia as your cause to raise money every time you shop. Your involvement with Mercy May, no matter how big or small, will make a vital difference to those living in desperate need. Host a fundraising dinner event with friends this May and purchase your food and drink from our retail partners to raise even more! Visit the Mercy May Campaign for event ideas and helpful tips on planning your May fundraising event. Shop it Forward for any items you need and give back even more.